Come take our Island Tour and see Molokai. Our primary mode of tranpsortaion to Molokai is by air since the ferry closed down. We work with Makani Kai as our primary carrier as they will change youf flight at no extra charge in the event of weather or the need to cancel. You can also fly with Mokulele or Ohana air. Just be sure to arrive on Molokai no later than 9.15am and leave no earlier than 4.30pm. If you are running late or the plane is delayed please call us. We have people arriving at all times from 6.30-9am for the tour. Enjoy the hidden beauty of Molokai from the air conditioned comfort of our tour vehicles. Depending on the number of participants you will be riding in either a 7 or 15 passenger van, the larger one has a microphone system so you won't miss any of the information our friendly guides have to share. Chose from our planned day trips, or plan your own private charter. We will make sure you see the best of Molokai. One of our most popular tours, the Island Tour averages 4-8 participants, allowing our guides to provide you with the personal touch. From the tropical east end to the cascading hills of the west side, you will experience and understand why Molokai captures the heart of so many visitors. This trip takes 7-8 hours. Our current schedule is 9.15am - 4.15pm. If you come in early or staying on island we will go to the West side of the island starting at 8am and time to then pick up everyone else at the airport. This is based on request. 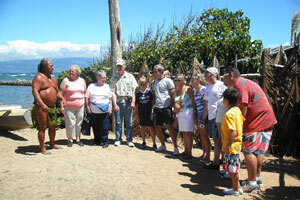 There is no better way to see east Molokai than from the comfort of one of our bus tours. Let our driver worry about the winding road as you are free to relax and enjoy the breathtaking scenery while we cruise along the coastline ending at a panoramic view of Halawa Valley. A short stop at a recently restored fishpond gives you a small glimpse into Hawai'i's past. In ancient Hawai'i, fishponds were an integral part of the ahupua'a, the land area that stretched from the mountains to the coral reefs. The Hawai'ians built rock-walled enclosures in near shore waters, to raise fish for their communities and families. One of four churches that comprise the St. Damien Molokai Catholic Parish, St. Joseph was built by Father Damien in 1876 and the church still stands as it did then, including the original confessional and Flemish ceilings. Enjoy lunch (included in your tour price) at their oceanside restraunt. 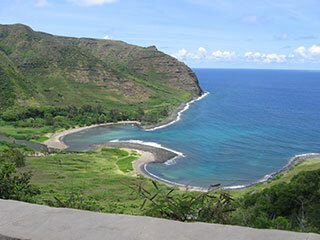 At the end of highway 470, Pala'au State Park is a cool getaway especially in the hot summer months. Here you can enjoy two short strolls to visit local landmarks. A light trail hike (roughly 3 minutes) through ironwood forest where you will enjoy a phenomenal view of Kalaupapa Peninsula 1600' below. In the 1850's when Hansen's disease, formerly known as Leprosy, swept through the Hawaiian Isles the worst cases were sent to this isolated peninsula. If time allows, we will also visit this sacred Hawaiian fertility site. One of many sacred places on Moloka`i, Kauleonanahoa is considered a place of much power and is especially significant to women who suffer from infertility. Visit with an open mind and respect the culture it is a part of. Just in time for an afternoon or morning treat and smaple their coffee. Purdy's is a family owned business. Tours of the farm include a walk through the grove to see the macadamia nuts in various stages of development. Sample the nuts and try your hand at cracking a few. If you arrive in early or departing late we will on special requests take you to the West End. Three miles of white sand beach with very few people. A beautiful spot for photos. Talk about small town, Maunaloa is a perfect example. A general store, post office, school and church are within walking distance of each other. You will definitely want to check out the Big Wind Kite Factory. Besides kites they have a wide variety of fun stuff for sale in their store. We are happy to accomodate your specific travel needs or desires with a private charter. Molokai Outdoors is a PUC licensed carrier and we can arrange a private charter for your Molokai adventure. School, church, non-profit, or community groups are welcome. Tell us where you need to be and when you want to be there and our friendly staff will make sure you arrive with a smile! Charters are a minimum of two hours. Time starts when the van leaves the base and ends when it returns. All reservations must be confirmed verbally. 24 hour cancellation policy. A 10% service fee may apply to all reservations cancelled 48hrs prior. We are also happy to help to arrange private charters with airlines for those coming from the outer islands.